This week I chose to write about an article published in "Newsweek", written by Evan Thomas. The article is titled "The Case for Killing Granny", and it is about exactly what it sounds like. The premise for the article is whether or not we are over treating and spending too much money (mostly from Medicare) on people either on hospice or just old age in general? In this day and age when diseases are becoming more and more apparent in old age, when do we draw the line to stop treatment and to live and let die? Everyone knows that the Baby Boomers alone are causing a major tidal wave that is starting to wash upon the shore as we speak. Give it ten years and we will have an overwhelming amount of elders in our nation, and most likely a lack of resources to treat them properly. But what is properly? Speaking about his mother who was diagnosed with lung cancer after smoking her whole life, Thomas quotes, "She seemed puzzled and a bit frustrated that she had to be so insistent on her own demise". Doctors are pushing for her to get this and that test done, and to prolong her life as much as possible. Now this ties in with my article last week as well. At what point do we cross the big "Euthanasia" line? At what point in time will it be not only acceptable, but encouraged, that we stop spending as much money on unnecessary treatment and prolonged life supplies on the elderly? "The need to spend less money on the elderly at the end of life is the elephant in the room in the health care debate. Everyone seems it but no one wants to talk about it. At a more basic level, Americans are not just afraid of dying, but about talking and thinking of dying. Until Americans learn to contemplate death as more than a scientific challenge to be overcome, our health care system will remain unfixable." As of right now, almost a third of the money spent by Medicare- approximately $66.8 billion a year- goes to the end of life patients in their last two years of life, when patients are the sickest. Studies show that about 70% of people want to die at home but that about half die in hospitals. How are we looking right past this? Why aren't we doing a better job of taking these specific elders that insist on not getting the tests and treatments and just want to die in peace at home? Doctor's face two challenges: First, they want to be heroes. They want to be heroes for themselves, for their patients, for their friends, for their reputations. Doctors have grown to be used to the fact that "Americans want the best, they want the latest, and they want it now." Doctors want to do all they can to cure these ailments and build a reputation. Also, most doctors nowadays are paid by Medicare based on procedures. Essentially, the more procedures they order, the more they get paid; which ties into their second challenge. Americans nowadays have also gotten brainwashed into the same idea. The more treatments and tests the doctor orders, the better he must be for it. He must be smarter, a better doctor. People feel like they have been "jipped" for their money if tests aren't run to see what's wrong…even if nothing is wrong at all. We are a society of hypochondriacs, and test results make us feel better. Thomas brings up a very obvious topic that I think us nursing students are all aware of, but no one really ever sits down to think about. Most elders, whether or not they are actually sick or just afraid, go to the doctors because it makes them feel better just going. They are essentially seeking a cure for loneliness and assurance, even if they are unaware of it. If we could focus our Medicare money and attention on money that could possibly go to organizations that are purely dedicated to spending time with the elders for a low cost, we could potentially save millions. If we spend more manpower, (not necessarily nurses or doctors) but even volunteers to sit with elders in their last years of life, to combat loneliness. What if that could work? We could create jobs to stimulate the economy by employing people to run or work for these organizations. "Death can be delayed for only so long, and sometimes the wait is grim and degrading". It Is unethical for doctors and medical professionals to prolong life on an unnecessary basis, when it is not wanted. For each case, they need a nurse's attention, they need a hospital bed, they need medicine, they need supplies, and they need manpower to help with whatever procedures need to be done. We could save all that if we just thought about why we were doing it. A Breakdown of My Current Clinical Fears. My last clinical was actually really boring. I was a little nervous about having my first teenager but not as nervous as my first baby two weeks ago. I have had teenagers (18+) on my med/surg floor at home, but only a couple. The baby 2 weeks ago was definitely my first baby patient. What I'm most scared of is getting a 2-10 YO because to me, that's a scary age. That's why I'm still a little hesitant in PEDS and certain about maternity. But I guess I have to just take one and hope for the best. Maybe I'll love and then change my mind about PEDS. This is the breakdown of my fear: Ages 2-4= I've seen some kids already in the hallway that do nothing but scream, even with their parent's right there. There is just no reasoning with them…I like to reason with my patients, to have a conversation with them. Ages 5-10 are more reasonable but I think less trustworthy…more secretive and afraid. I just don't know what to say to them. My younger sister can approach any kid and within 5 minutes, they love her and want to be her best friend. She is 16. But even with my own cousins who I see a couple times a year and range in age from 4-12, there just seems to be a barrier between us no matter how hard I try. I don't want there to be, I think they are cute and I would love to sit and talk with them but when me and my sister stand together, they always flock to her first. Am I the scary adult already? Am I less approachable? Is there an invisible barrier/ wall that I put up around me that I am unaware of? Most of the time, when I am alone with them, (whether I'm babysitting or just happen to be alone for whatever reason) I just don't know what to say. I find talks about "Dora the Explorer" boring, really. I can't seem to temporarily come down to their level. I become afraid of appearing too corny, and they'll see right through me. On the other hand I am afraid of coming off as too official and scary. I need to figure out a nice in-between. I like the age of 10+ because I can treat them more like an adult. They really are like miniature adults….and usually surprisingly smart. The other thing I wanted to mention this journal was my teenager this week in clinical. First off, teenagers are hard because they are a whole different species. Seriously. And I just got done being a teenager only 2 years ago, and they are already turning into another species. I guess I'm getting old. She really didn't want to be bothered. I tried to not let that stop me and to pry for the right information and show her that she can talk to me, but I got nothing. I could tell she thought it was awkward. On Friday this week we are all required to go to Trenton High school for a 5 week "self esteem" session. It's all sophomore girls and they elect to be in this instead of gym class. It's a nice program because they get counseled on correct nutrition; they have a workout every day, etc. Our job is to come in here on Fridays for five weeks and basically, be a friend. We are supposed to counsel them on drugs, alcohol, smoking…better nutrition, their caffeine intake, how much sleep they get, tips for their future, tips for school…you name it. Needless to say, I'm a little nervous, but I'm nervous with every new thing I do so this isn't any different. I need to break that habit. I'm always nervous about new experiences. I guess I'm only human. 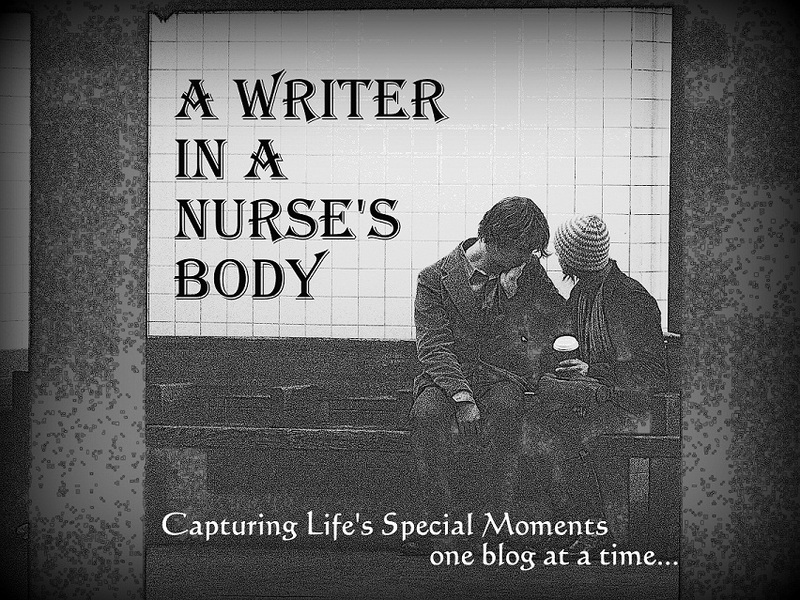 ~A writer in a nurse's body. A Look Into Alzheimer’s: Is Early Diagnoses a Better Diagnoses? 20 years ago, Alzheimer's was an inevitable fear looming in the minds of aging adults reaching their 60s. Everyone knew about it, was afraid for it. People in their late 50s forgot their keys or forgot someone's name that they just met and immediately thought they had Alzheimer's. People with parents or close relatives with the disease thought they were sure to be doomed to have the inevitable disease included in their destiny. The article I choose this week to write about focuses on the benefits of diagnosing Alzheimer's early, but today I also want to talk about my own feelings on Alzheimer's development. The article, "Early Diagnoses Lets Patients Look Alzheimer's Square In the Face", written by Alexi Friedman, makes a strong point that people that are diagnosed early enough and are put on immediate medications, have a much better chance of slowing down the disease. She brings up a member of her community who was 72 years old and was having difficulty remembering things. Upon learning she definitely had the degenerative disease, she made proactive decisions to join a safe housing structure with support group meetings, make "to-do" lists, and get on the right medications (Aricept or Namenda). Even nursing home and care centers that specialize in Alzheimer's care are noticing the difference, and are expected to start changing their plan of care within the coming 20 years. Quote from vice president of the Alzheimer's Association of NJ, "This type of self advocacy by patients was virtually unheard of 20 years ago, when caregivers were the ones to reach out for information and support. But as more people are diagnosed earlier, they [patients] are increasingly taking control of their own futures and, by doing so, forcing traditional Alzheimer's organizations to rethink their missions." I think its great that these patients are choosing to take control. They want to remain part of their lives and the decision making process. Years ago, all we, and the patients suffering and their caregivers did was hope that the unknown researchers were hopefully making progress on the cure somewhere out there. We sat back and watch the killer disease rip through the brain and create multiple broken hearts. But now the patient can slow it down. Multiple video games even are being released purposefully directed at the aging adults. These games include mind games such as word puzzles, anagrams, and other puzzles that "make you think". The other topic I wanted to bring up was something I had a good conversation with my boyfriend about. We got started first when I had mentioned that people were living to be so old nowadays, and how it was so strange to think about back thousands of years ago, my age right now (21) maybe being one of the "elders". How strange is that? I had asked him, how could it be that over the thousands of generations, how in time did it get to be that nowadays a 15-25 year old is seen as somewhat immature, that we are still "so young". If we have a baby, we are looked down upon for it. We shouldn't be married so young…but back then, 12-20 year olds were forced to have babies. They were married at 12. If they were lucky to even make it to 25-30 they were a town "elder"…even though they probably looked like I do right now (body type wise). Did they even know what we today call an "old" person looked like? What happened to a human as it got older? Were there some breakthroughs that made it past 60? He replied with the fact and very interesting thought that maybe human beings aren't and never were supposed to get old…Maybe that was never intended and we are making a mistake by extending our lives so much. Maybe Alzheimer's was never supposed to happen, and it is not a disease per say but a natural reaction to the brain fighting old age? If we all lived long enough and died from no other cause, I'm sure we all would eventually get it. He made the point that the body fights getting older, with arthritis, and heart attacks, etc. Maybe God had never intended for us to live this long (on average) and the fact that we are actually intentionally prolonging life is a huge mistake. I take the stand personally on letting death happen naturally. Sure, It is tragic when someone dies prematurely in a car accident or murder when they were otherwise healthy. Should we fight to keep them alive, if they have a chance? Yes, In most cases. But should we give donor implants and artificial limbs to people above the age of 70 just so they can stay alive artificially? We wonder why our planet is getting so crowded…We wonder why and not ever before we are experiencing Earth's fight back on us for being too harmful to the environment. We were never supposed to be here this long, and we got too smart to figure out how to artificially let us stay here longer. So should they keep fighting for an Alzheimer's cure? Yes. Why? Because who wants to spend the last 10-30 years of their life in a nursing home or assisted living or even worse stuck in bed, or not knowing who their children are or where they are? Who wants to spend 10-30 years with a spouse or parent that doesn't know who you are? Who would ever want the feeling of not remembering anything or being told they weren't allowed to drive? Although I believe that we shouldn't artificially prolong life, curing Alzheimer's isn't prolonging life. It's making life more enjoyable. Technology: Is it Rewiring Our Sense of Communication? I picked an article called "Getting 'Disconnected' is Next to impossible" and it reached me in a lot of ways; I found it very interesting. First off, the article is written by a weekly columnist in my home newspaper, Leonard Pitts, and is about how because of cell phones advanced technology nowadays, it is nearly impossible to disconnect from our society. Not only cell phones, but credit cards, GPS, cameras, ATMs, email, facebook, subway cards, EZ Pass' all connect us to a world to a point where we can always be tracked, always be found. Even Ipods nowadays can connect to the internet from anywhere. More and more restaurants, even my local laundry mat has free wi-fi available now. The interesting part is, most of us at this point in time no longer want to be disconnected. Despite us having cell phone's for ten years, and heavy use of them within the last five years, if we lose our cell phone or forget it at home, it turns into a major daily crisis. And we all know that's true! Forgetting it at home, despite having an hour drive to work, class, etc., some people would find it acceptable to turn back to get it. How is it possible to survive the day without being in touch? What if people worried about you all day because you weren't answering? How would you arrange meetings, friend or business? We forget that not too long ago this would have sounded completely absurd. If you forgot it on a business trip that lasted over a week, most people would probably consider if not actually buy a new phone. Quote the columnist who did forget it at home on his business trip, "Had I found myself standing there in my underdrawers, I don't think I'd have felt more naked. There was this panicky sense of isolation, this disconcerting feeling of being cut off. Whenever I confessed my plight, I got looks of stark pity like you'd give someone with a terminal disease." Has technology actually developed the power to control our lives like this? Has technology "utterly rewired our sense of what it means to be in touch?" Are we losing a sense of real human communication face to face, or just moving into new sense of communication that is natural in the "future"? What will our future be like if this is what it is now? Will we even have to talk to each other? Will you be able to have a complete conversation with your friend in person without speaking? Even today we can see each other from a hundred thousand miles away through web cams. We can talk to soldiers that we love… So is this a bad thing? I don't think so. I think its just a new thing. The people that disagree are the people that are too used to a non-technologic world where you walked to your friend's house to see if she wanted to grab lunch instead of texted them. However, I am seeing more and more people over the age of 65 now that are very much able to use their cell phone fluently. My own grandmother already has a facebook page and she is 75! So how does this relate to nursing? How can this be an advantage or disadvantage to nursing? Does this type of communication have any right to enter the world of nursing? IPods nowadays can download applications that can help nurses make correct IV calculations. They have ones that have a complete drug guide installed. You can download textbooks to these, install a Spanish translation (among other languages) to these devices specifically for nurses to use. You can download a database that has thousands of diseases saved that can be identified if you punch in a couple symptoms…Is this OK? Is it a major disadvantage to be using this small device that patients may mistake to be a cell phone in front of them? Can we rely on these calculations made by these devices for accurate IV doses? Or are they even more reliable and accurate then our human brain? Something to think about. Nurses nowadays are constantly being told to turn off their cell phones in hospitals, as well as patients, patient's families, etc. But who actually has the willpower to do so and not turn it back on? Particularly when you are working a 12 hour shift? Most nurses have their cell phone somewhere on their body, and it is usually turned on. Movies always ask for you to turn your phone off, as well as the theaters, airplanes, because it affects speakers and technology. But they are actually making speakers that won't be affected by the cell phone interference now because everyone knows you can't ask an entire audience or airplane to turn off your cell phone. I am not about to sit here and lie about my knowledge of politics. I pretty much only know the basics and personally choose not to bother myself with the stress of nationwide and worldwide politics. To me, Its all jibberish. Sure, I voted. Sure, I didn't like George W. Bush. Why? Because on my basic level of knowledge of politics on the surface, I didn't see any clear evidence of good accomplishments Bush was making in his presidency. Barack Obama, although many are already unimpressed, I have a good feeling about. But that's not what this essay is about. The article I choose is titled, "Iraqi Shoe Flinger Gets Hero Treatment" and was featured in the USA Today and written by columnist Nadeem Majeed. Last December, Iraqi TV journalist Al-Zeidi threw both of his shoes at President George Bush during a speech in Baghdad. Bush was unharmed, and Zeidi was immediately arrested and thrown in a Baghdad jail for nine months (originally a three year sentence). Iraqis have many mixed feelings about this, as do I, America, and the Bush family. Most Iraqis are treating Zeidi as if he saved 100 people from a burning building. On a telephone interview an Iraqi quotes, "All Arab people…hope to get the chance of doing of doing what (Al-Zeidi) did." Zeidi, due to be released this Monday has received the following in his honor: Full pay by his employer while he was in jail, a two story fully furnished villa bought by his employer, numerous wedding offers, with brides coming "loaded with jewels and gold", A prince in Qatar has offered to pay for all his health care, A businessman offered Zeidi $10Million for the "famous" shoes… His brother quotes, "What he did was heroic and deserves all this appreciation from people who hate occupation". Bush has downplayed the incident, despite him looking foolish ducking the shoes being chucked at him on national T.V. He plays it off as a "show of dissent in a newly democratic Iraq." Former first lady Laura Bush calls it no laughing matter and it was a direct assault. A common Iraqi man also has mixed feelings as he quotes "He should have spent more time in jail to learn how to respect guests". What it comes down to, is how is one to define a hero? Webster defines hero as " a man admired for his achievements and noble qualities or 'one that shows great courage'". Clearly, the Iraqis think that Zeidi fits this description on their side. Technically, every "side", every "team" has their own hero, and he/she is the enemy, or the "villain" to the opposing side. But who is right? In the Iraqi eye, George Bush might seem like the "evil villain" which is why they feel no remorse for treating him with disrespect. Take a common action movie for example. We (the audience) are exposed to one side, one team. We learn to love our hero character, we are rooting for his/her side throughout. The movie usually shows clips (maybe) of the villain side doing horrible things to detriment the "good side". But if you flip it around and look at both sides of the story, the "villain" is doing what he feels what is right and what he needs to do. Excluding your typical comicbook where the villain is just some nasty troublemaker that is in it for pure joy and evil, most villains nowadays are common people that are fighting for their own cause, their own dignity and respect, or fighting for their own country. Technically, in the eye of many other countries, the USA is the "bad guy". But who is the "good guy" in every American movie? Duh. Its all about whose side is portrayed and how.